We love the aroma of essential oils and we use them in our Grecian Secret Body Souffle which is our all over body care cream, yet is loved as a face care cream by women as well. For women that tend to be fragrance sensitive and must avoid perfumes, they may also think a fragrance oil and an essential oil are one in the same thing, so we want to clarify their distinctive differences. Especially when essential oils are infused with a fragrance oil or vice versa to maximize their fragrance, including being used in many perfumes today. Any essential oil right out of the bottle in full concentration can have similar reactions for people that perfumes cause, such as headaches, dizziness or nausea. This is a fact of life about anything considered fragrant and essential oils are not any different in this context. Just because it comes directly from the flower or fruit, doesn't make their concentrated scent any less offensive to some noses. What some women don't realize about essential oil aromatics however, is they are nothing close to being perfumey or overpowering such as what you would get in a cologne or an artificially fragranced skincare product. So If you don't know about our lovely natural scents in our body souffle formulas, we encourage you to try a sample and see how you like it. We can assure you the scents are wonderful and will never overpower your delicate senses, and they are not solvent extracted, only cold processes or steam / water distillation are used. However, if this is still not your cup of tea we do offer an Unscented formula. 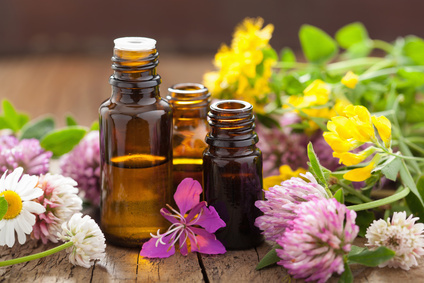 Essential oils are distilled naturally from many different parts of plants and their oils are refined and bottled for use in many applications including those for holistic therapies. Massage therapists using them mixed with carrier oils like olive oil to soothe the senses and elevate moods while getting a relaxing massage. Plus, it is important to note that essential oils are never used full strength and are added in small percentages to our grecian secret body souffle whereby creating a pleasing scent that won't assault even the most sensitive nose. This is what makes them perfect for skincare because for the women who tend to be fragrance sensitive, essential oils can enhance or soothe their moods due to the subtlety in aromatic fragrance they provide. Unlike perfumes or synthetic fragrance oils, the aroma dissipates quickly, leaving behind softened, sensual, moisturized skin along with a sense of well being. The reduction in the essential oil also reduces skin irritant factors that can occur with artificial fragrances or if the essential oils were applied at higher concentrations. The perfect balance in skincare is essential! Fragrance oils on the other hand are synthetically created, are considerably more potent and their scents can be extremely overbearing, and won't generally dissipate whereby causing the headache or nauseated feeling some women get that are fragrance sensitive. Fragrance oils are something that some natural soapmakers and candle makers prefer in a lot of cases since they hold their scent better after manufacturing. In fact, essential oils can be used in combination with artifical fragrance for the best aromatic design. Specific essential oils do maintain a certain level of fragrance, but top notes of Citrus for instance, will not hold up as well once exposed to air and light, so a candle or soap will lose this lovely scent much quicker than notes that are more woody, spicy or earthy, such as patchouli, sandalwood, ylang ylang and lavender. Citrus notes like bergamot, lime, orange, lemon and mandarin are more subject to oxidation so they lose their scents rapidly. Hence the demand for an artificially created citrus for certain applications. For instance, if you ever owned a citronella candle for supposedly warding off mosquitoes, you'll notice their scent is gone in a matter of a day or two once the package is opened, rendering them useless for their purported task. So for perfumers, soapmakers and candlemakers the fragrance oil becomes the necessary ingredient in these applications, and in many cases a mixture of essential and fragrance oils are part of the recipe for the complete aromatic experience. We know artificial fragrances can be offensive to those around you as well, which is another reason essential oils are so wonderful. They absolutely will not carry over to others in the room and after 30 minutes or so, the enchanting aroma you enjoyed during application is now only a memory until the next time you apply your moisturizing body and face cream. Essential oils are designed to create a sense of well being, not force your head to pull back when you pop the lid on your jar of cream in the same way some perfumes can. So if you have avoided a scented product using ONLY essential oils in the mix because of a past bad experience with fragrance, then we encourage you to check out our body souffle since they are not remotely the same. You may learn that you are finally able to experience the same brief enjoyment so many other women love in their after shower morning routine. The purest of intoxicating scents found only in aromatic essential oils.